Following is an online version of my presentation at the 34th Annual Dream Conference, International Association for the Study of Dreams (IASD), June 18, 2017. I'm a writer and thought all writers recorded their dreams because I heard about it in several writing classes and many books on writing. It all started in 1986 because of compelling dreams I had about my first crush. Scott and I had last seen each other around 1974 before I went away to college. Twenty years later I got back in contact with him and we became best friends. We spent our forties together. However, before our relationship could get started, he told me he was using heroin. I told him I could not go through with it, and I moved back to Phoenix. 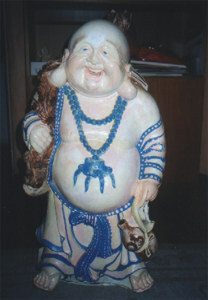 Some months after that, I found a three-foot high Ho Tai laughing Buddha in a used furniture store. He was plaster, with an antique finish. As soon as I got him home, I painted him white with pink and blue details. Then I set to work building a garden for him in the backyard. I had 19 dreams about the Buddha Zen garden. The dreams coincided with the time I reconciled with Scott. He told me he had totaled his sister's car in Oregon and was arrested and had to go through a drug treatment program. He returned to Los Angeles after he fulfilled his commitment to the drug treatment program and I moved back several months later. After presenting the Buddha garden dreams, I will conclude with a short explanation of how I found out about Content Analysis. I'll also briefly discuss the data I've extracted from my dream series. April 3, 1996 - I go into a store to get things for the Buddha. They treat me kind of rough (like Monterrey Tile Monday) but I find a few things I need and make them friendlier. April 4, 1996 - Building the Buddha garden. Instead of being committed to one person (like Dave), I want to just be friends - put Mary and Jesus back there somehow. April 5, 1996 – I'm working on the Zen garden. I want Chaits to help me but he declines; prefers office work. April 6, 1996 - I find people to help in the Zen garden but they see it more as a business. April 7, 1996 - I get people to help in the Zen garden. It has had three celebrities interested. The actress Corrigan Way (?) is very interested - even wrote an autobiography about it. Another fan uses the book to learn more about caring for a Zen garden. My father appreciates it. He helped a lot too. April 9, 1996 - I find more people to work on the Zen garden. We will use more love and understanding. These are like little paper boats that I will float out on the water, someone tells me. I call K. Kleidis too much - it might look suspicious. Yesterday Bill told me that Jerry Garcia's ashes were floated on little boats on the Ganges (?) River in India. April [undated], 1996 - Things are getting all better in the Zen garden - I tell a few people about the garden. April 12, 1996 - Friends and I work on a project together - (Zen garden?). Angels direct us to make choices, decisions. April 13, 1996 - Long dream about candles, me, Scott, getting healed. Can't remember dream. April 14, 1996 - Working on the Zen garden to heal people. Certain steps contain a peace formula. Instructions have diagrams that show peaceful use of the garden - I want to follow them. April 15, 1996 - When I finish the Zen garden everyone will feel included. A few people left: Scott and Pam I line them up at the top of the page and can eat them up in two bites. They are like toast jelly butter. April 19, 1996 - Working with some other people to finish the Zen garden. There's not much "important" work left to do, so even I must accept a minimal role. April 26, 1996 - I try to start a business with hemp cloth / hemp cheese. I try to start it in the backyard, in the Buddha garden. Scott and [his sister] are there. They are part of the new business. April 27, 1996 - The Buddha garden is all done. I was one of the first to break away and start it. April 28, 1996 - I read an article about working in the Buddha garden then write my reply. Scott reads it. April 30, 1996 - All is not lost - a long distance phone call can't tell the real situation. Scott works in the Buddha garden without complaining - no lines were crossed, a seed is planted. April [undated], 1996 - In the Zen garden. I hear that when his father died, Scott became a columnist [like his father] and worked in the Zen garden writing and digging. May 1, 1996 - [I] worked in the Zen garden, Scott is glad there's still a good connection. 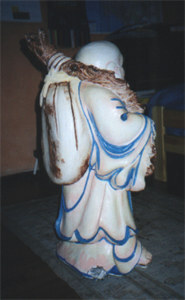 Ho Tai in the Buddha garden. My dreams affirm the three main continuities, as Bill Domhoff describes in his book, Finding Meaning in Dreams. 1. Continuity with all people's dreams. 2. Continuity in one individual's dreams over time. In 1986, when we were not in contact, Scott in seven dreams. Ten years later, the year of the Zen garden dreams, he appeared 59 times. Ten years later, the year after we broke up, he appeared 39 times. Ten years later, the year after he died, he appeared 13 times. He continues to appear in my dreams. My dream journals show how I have dreamed about the same characters my whole adult life. Besides Scott, other frequent dream characters include my father and his friends, my mother, and my ex-husband. 3. Continuity between dreams and waking concerns. The Zen Garden dreams provide an example of dreams flowing along with waking life. "I gave a bell to the neighbor; now they use it for a dog toy." The Buddha tells me I can't control it. That's pretty much how I felt about him. I offered to give him my friendship and company, yet because of his drug habit, he didn't value it. In the dream he tells me he shoots heroin. That mirrored our talks about his drug use. He was always completely honest about it. "I find more people to work on the Zen garden. We will use more love and understanding." This was my mindset at the time. Plus, I believe it shows my desire to get back together with him. "Things are getting all better in the Zen garden - I tell a few people about the garden." This relates to healing my relationship with him. "Angels direct us to make choices, decisions." This also relates to him. "Long dream about candles, me, Scott, getting healed." "When I finish the Zen garden everyone will feel included." "A few people left: Scott and Pam I line them up at the top of the page and can eat them up in two bites. They are like toast jelly butter." Two people I felt alienated from, thus not included in the Zen garde, were Scott and Pam, his teenage-years girlfriend, the older woman who stole him away from me. The dream speaks to how thoroughly I have forgiven her. "Scott and [his sister] are there. They are part of the new business." They will be part of my future. "All is not lost - a long distance phone call can't tell the real situation. Scott works in the Buddha garden without complaining - no lines were crossed, a seed is planted." I believe this dream occurred after an argumentative phone conversation. "[I] worked in the Zen garden, Scott is glad there's still a good connection." The dream confirms he reciprocated my desire to be on friendly terms again. The chairperson and first presenter at the panel discussion, Kelly Bulkeley, Ph.D., discussed the statistics from my dreams. He derived the statistics using the forty standardized word strings he developed for lengthy dream series. In feedback from the audience members, they noted the decline of religious symbols in my dreams. 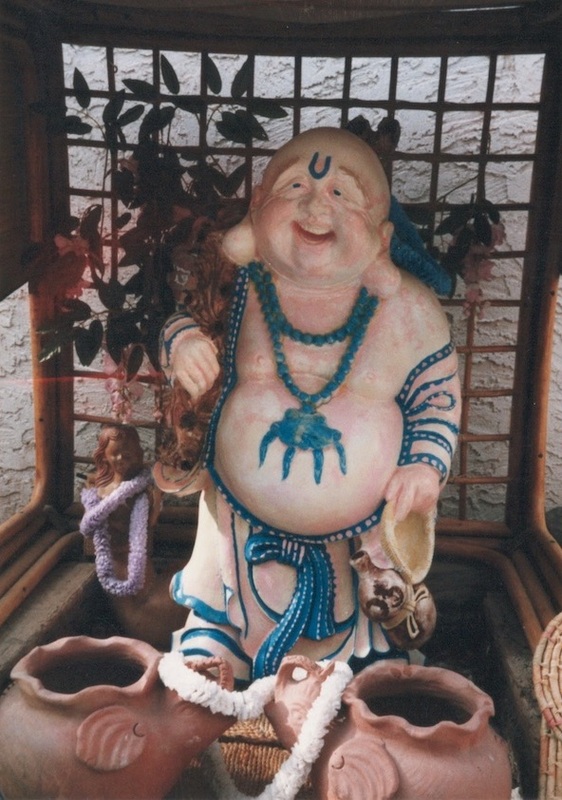 In the first sample, 1986, when I was a full-time member of the Hare Krishna organization, I have more than three times the norm of religious symbols. The next sample, 1996, includes the Buddha garden dreams, which drove up my religious symbols count. The samples from 2006 and 2016 are much closer to the norm. The friendly interactions in my dreams are close to the norm, but only my 1986 physical aggression levels are at the norm. In subsequent years, physical aggression is much lower, and that reflects how my mind works. 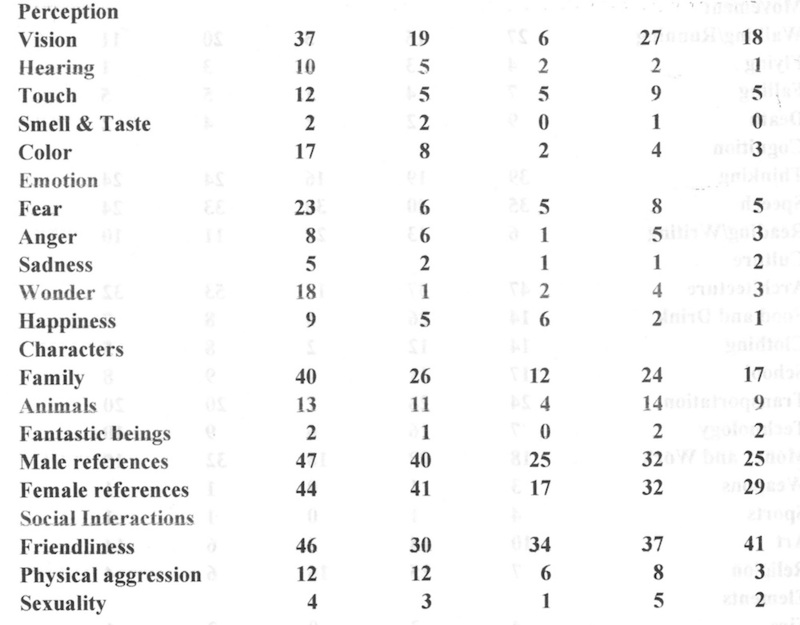 The 1986 physical aggression statistic was probably higher due to the violent murder of a friend of mine, which took place May 20 of that year. Dr. Bulkeley pointed out the statistic for architecture in my dreams shot way up in 2006 and asked me why that might be. I entered real estate school and got my license in February, then went to work full-time for Century 21 starting in March. My dreams are on average shorter than the norm and scored below the norm in most of these categories: Perception (Vision, Hearing, Touch, Smell & Taste, Color), Emotion (Fear, Anger, Sadness, and Wonder). 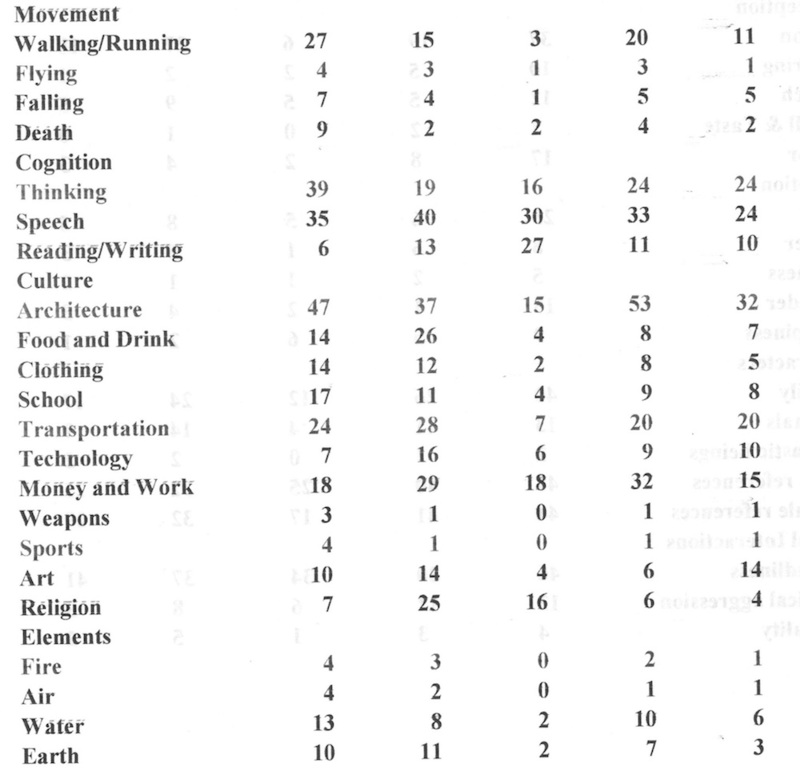 Dr. Bulkeley suggested the low scores in these categories are due to the short dream length. Here are the raw statistics. The first column lists the categories; column two is the baseline norm; the last four columns are my four dream samples - 1986, 1996, 2006, and 2016.